BoJack Horseman fans going through withdrawal after the conclusion of the third season can satisfy their craving for more of the show’s absurd, pun-filled humor by checking out Hot Dog Taste Test (Drawn & Quarterly), the second collection of comics by BoJack Horseman producer and production designer Lisa Hanawalt. It’s a strange, silly assortment of comic strips, sketches, painted illustrations, text pieces, character/prop designs, and photographs of pottery and plates of food, which all add up to a fascinating exploration of Hanawalt’s various creative impulses and multidisciplinary artistic talent. Hanawalt makes food funny by placing familiar foods in ridiculous new contexts. The book begins with a painting of a dog show for hot dogs, in which proud owners parade their hot dogs in front of judges that evaluate them for size, texture, and taste, a visual that sets a cheeky, off-kilter tone for the rest of the collection. “Banana Embellishments” presents options for using a banana as a fashion accessory, “Snack Realism” combines flavored snacks with the thing they’re flavored as (popcorn mixed with popcorn jelly beans, for example), and “Holiday Food Diary” breaks down what goes into the creation of an imaginary feast composed of nonsensical ingredients. She also spends a lot of time on what happens after this food is digested, and while her fixation on bodily functions may come across as juvenile, she makes a good point that going to the bathroom is the inevitable result of eating, so why is it so inappropriate to talk about? Hanawalt has a passionate affection for the natural world; she fills these pages with drawings of plants and animals, many of which are anthropomorphized in BoJack style, but that affection doesn’t interfere with her appreciation for the food that comes from the natural world. She’s fascinated by how people interact with food and how it connects them to their community, two themes that play a significant part in many of the book’s longer pieces. These are the most compelling parts of Hot Dog Taste Test: the time-stamped logs of her experiences shadowing chef Wylie DuFresne and swimming with otters in California, the accounts of her culinary excursions on the streets of New York City and the buffets of Las Vegas, and most substantially, her Argentina travel diary. Comics are commonly thought of as a language, with international variants—namely, the Franco-Belgian bande dessinées (drawn strip) and the Japanese manga (whimsical pictures)—similarly being conceived of as distinct, though overlapping, languages. This, however, is a problematic understanding, and it’s more accurate and useful to think of comics as a language tree: American, Japanese, and French comics are dialects that share certain fundamental traits, with each dialect generating new divergent branches with the introduction of economic developments; cultural traditions; and innovations of new cartoonists, scenes, and epochs. It’s this indiscrete conception of the comics tradition that Š! #25 (Kuš) explores. Titled “Gaijin Manga”—“gaijin” being the Japanese word for foreigner—this issue of the Latvian anthology takes as its theme manga made by Europeans and Americans, that is, work that riffs on or pays homage to Japanese cartoonists that have influenced the respective cartoonists. The result is Dilraj Mann’s “Everyday,” which invokes Katsuhiro Otomo’s Domu and Akira. Unlike his other work, which is usually colored with flat, bold tones, here Mann renders his story with Zip-A-Tone, unadorned inks, and what looks like red pencil. His lines are loose and expressive, and they have the striking texture of an unfinished comic. The other cartoonists, aesthetics, and titles invoked are often more obscure than Akira, with the contributors riffing on Tadanori Yokoo, Seiichi Hayashi, Moto Hagio, Yokoyama, and King Terry. In fact, the breadth and diversity of aesthetics on display subverts the dominant discourse on manga—i.e., gravity-defying hair, big eyes, and the lack of backgrounds. Instead, the contributors of “Gaijin Manga” demonstrate the futility of taking “manga” to mean anything other than “a comic produced in Japan.” Some of these stories, like Luis Yang’s “Tabako,” certainly do play off these more familiar elements, but others, like “Trance Dream Techno” by Portuguese cartoonist Hetamoé, more immediately recall the distended and twisted figures and slurry of screeching colors adorning Grimes’ album Art Angels. It is difficult to deny the vast chasm separating Hetamoé’s swirl of lines—striking images and text that seem to flash like a neon sign in the dark—and something like GG’s “Lapse.” The latter’s lines are crisp and clean, their use of color limited, striking, and deeply affecting. The differences are so great that comparing them is like trying to compare primal rage therapy to meditation. One of the most challenging things when it comes to monthly comics is the serialized format inherent to the publishing schedule. Keeping up with the demanding pace is hard enough, but creators also have to worry about putting out issues that are understandable with several weeks, or sometimes months, between release dates. Add that to questions about how trade paperbacks should be divided and printed, and it’s a recipe for easy disaster, which is why editors are so important to so many comic creators. Once in a while a book comes along that makes all that feel effortless, readers floating from issue to issue without any trouble or loss of continuity, and Hex11 is certainly one of those. The first three issues are available for free through the new comiXology Unlimited program, but Hex11 #7 (HexComix) is the start of the second story arc, and it starts readers off with a bang. It isn’t strictly necessary to go back and read the previous six issues, but with half of them being free, it’s an easy sell for the art alone. 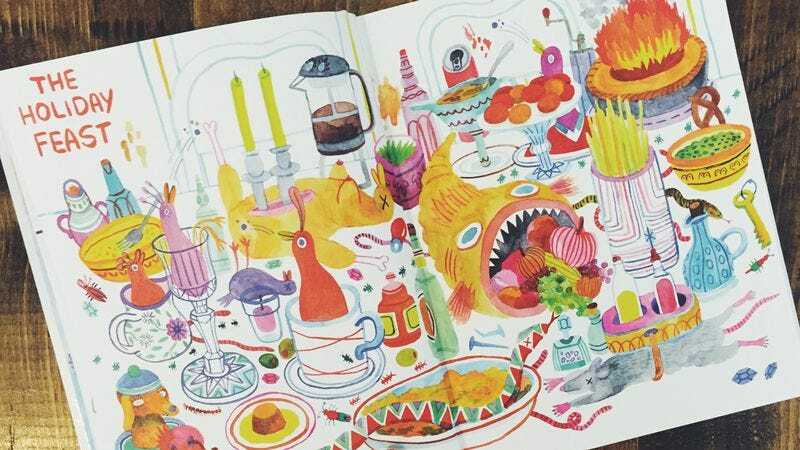 Lisa K. Weber is credited for both the art and the story, and her style is unlike a lot of what you’ll see at even more adventurous publishers. The sleek kinetics of the characters, the way motion is conveyed with voluminous fabric or hair is closer to animation than most sequential work. It looks like a mixture of the movies Atlantis: The Lost Empire, Treasure Planet, and The Prince Of Egypt, with swooping organic shapes and character designs similar to Dreamwork’s traditionally animated movies. The backgrounds are comparatively simple, but there’s a lot of texture to them; the palette is fairly muted, but Weber and color assistant Samantha Carrasco punctuate action with bright reds and neons that beautifully accentuate the smooth curves of Weber’s lifework. We sometimes find death waiting for us when we least expect. Pascal Girard suffered a monstrous loss as a child: He watched his baby brother die when he was only 8. This changed him in many ways small and profound. Nicolas (Drawn & Quarterly) gives us Girard’s life with his brother—not simply related to their interactions but also to the ways in which his brother’s absence still dictates the character and substance of his life. We don’t see Nicolas die, but we see Girard’s reaction to being told about his brother’s death. We see his joy, as an adult, at finding out he does not possess the genetic marker to indicate the presence in his DNA of congenital lactic acidosis. Girard is ruthlessly honest about the ways he uses his brother’s death in various parts of his life. He uses it to get attention from women. He uses it as an excuse to beat himself up for not living to his supposed potential. He feels guilty that he’s not doing enough to remember his younger brother, especially given his distant older brother, Joel. He even tries praying to his brother in heaven, once, to help procure a video game. Nicolas was originally published in a tiny print run 10 years ago and was reportedly created in less than three days. There’s not a single wasted line in the entire book, and similarly there’s no sense that Girard is in any way sparing his own feelings in the creation. Nicolas is dead, and his absence blew a hole in Girard’s life that has never quite been filled, often to the author’s significant detriment. The book gains everything from the directness of its spare style. Despite the speed with which it was produced, the book does not seem rushed or slapdash—more like quiet and spare. There are no superfluous lines, just the most crucial moments from the brief life and afterlife of the cartoonist’s brother. Girard cites the early Jeffrey Brown as a key influence—not the Brown of endless Star Wars gift books but the Brown of Clumsy and AEIOU: Any Easy Intimacy, the cartoonist who made his name with minimalist relationship dramas told through a seemingly random succession of anecdotes, seemingly off-the-cuff books constructed with the greatest care and attention to detail. In conception and execution Nicolas replicates the same trick, dealing frankly with emotionally exhausting material by using sparse cartooning as a means of communicating just enough emotion. Girard’s simple and elegantly expressive drawings communicate his feelings far more gracefully than any number of prose captions could.